functions to each release of OS/400 and i5/OS to make the configuration and use of the IBM System i in a TCP/IP network easier and more powerful. 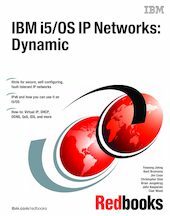 If you need to design an IP network that is self-configuring, fault-tolerant, secure, and efficient in its operation, then this IBM Redbooks publication is for you. i5/OS has always had many built-in Network Security features. These features have been enhanced to include an Intrusion Detection System (IDS). This allows you to be notified of attempts to hack into, disrupt, or deny service to the system. Moving up to the application layer, we demonstrate the dynamic power of IP by having the DHCP server assigning IP addresses and automatically updating the i5/OS Dynamic DNS. Now clients and servers can be added dynamically to the IP network and assigned a name automatically.